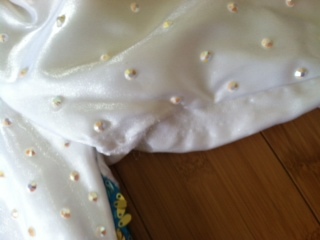 Beautiful 9 month old Gavin with tear drop gradient color sequins and hundreds of Swarovski crystals. 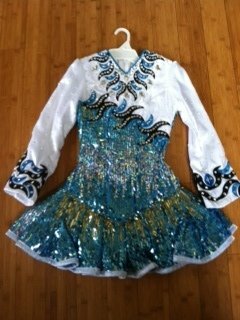 Dress includes white satin bloomers. 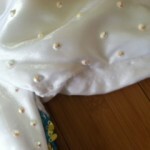 There is slight wear under left arm pit and on embroidery that is on the inside of the arm/next to skirt. Both areas have been treated with “fray check” and are not visible while dancing. 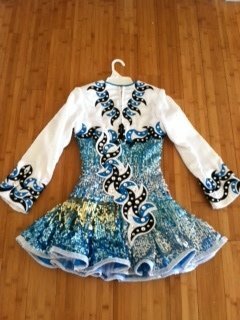 Matching Swarovski crystal shoe buckles and headband are available, but sold separately. **full length measurement below is measured in front from shoulder to hem. Full length measurement in back is 28.5″. **Bodice is measured shoulder to waist from shoulder seam to “natural waist” – not drop waist seam of bodice and skirt. 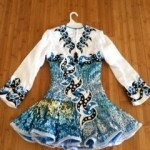 Skirt is a “skater type” and measures 6.5″ at center and 9″ on sides. Asking Price: $US1525.00. Shipping costs are included for my own country, overseas shipping is extra. Returns are negotiable.